The Back-UPS Pro provides abundant battery backup power, so you can work through medium and extended length power outages. It safeguards your equipment against damaging surges and spikes that travel along utility and data lines. And it features automatic voltage regulation (AVR), which instantly adjusts high and low voltages to safe levels, so you can work indefinitely during brownouts and overvoltages. The Back-UPS Pro also includes unique "green" features, like power-saving outlets that automatically turn off idle peripherals. A high efficiency charging system and "AVR Bypass" also reduce power consumption. 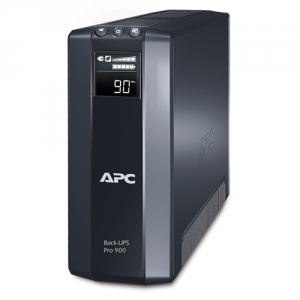 With the rest of the Back-UPS Pro's standard features, this is the perfect unit to protect your productivity from the constant threat of bad power and lost data.